Please note: The digital edition does not include 2 of the 76 images that appear in the physical edition. American ruins have become increasingly prominent, whether in discussions of “urban blight” and home foreclosures, in commemorations of 9/11, or in postapocalyptic movies. 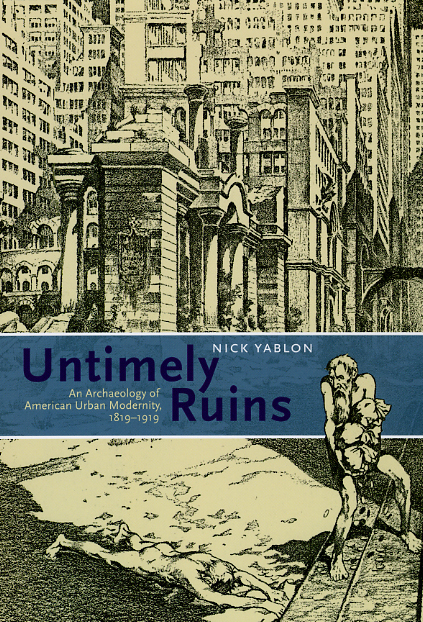 In this highly original book, Nick Yablon argues that the association between American cities and ruins dates back to a much earlier period in the nation’s history. Recovering numerous scenes of urban desolation—from failed banks, abandoned towns, and dilapidated tenements to the crumbling skyscrapers and bridges envisioned in science fiction and cartoons—Untimely Ruins challenges the myth that ruins were absent or insignificant objects in nineteenth-century America. The first book to document an American cult of the ruin, Untimely Ruins traces its deviations as well as derivations from European conventions. Unlike classical and Gothic ruins, which decayed gracefully over centuries and inspired philosophical meditations about the fate of civilizations, America’s ruins were often “untimely,” appearing unpredictably and disappearing before they could accrue an aura of age. As modern ruins of steel and iron, they stimulated critical reflections about contemporary cities, and the unfamiliar kinds of experience they enabled. Unearthing evocative sources everywhere from the archives of amateur photographers to the contents of time-capsules, Untimely Ruins exposes crucial debates about the economic, technological, and cultural transformations known as urban modernity. The result is a fascinating cultural history that uncovers fresh perspectives on the American city.